ITV is to become the free-to-air home of all new series of the hugely popular Seth MacFarlane comedy Family Guy, taking the rights away from BBC Three. Beginning this autumn, all new series of Family Guy will have their UK premiere exclusively on ITV2, The multi-year deal also includes other Seth MacFarlane animated comedies American Dad, The Cleveland Show and new series Bordertown. 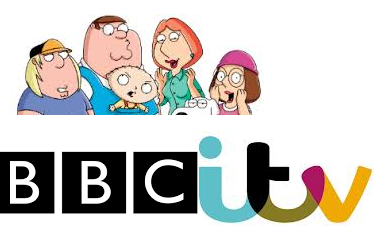 The announcement appeared to contradict an earlier announcement by the BBC that it would be retaining Family Guy until the beginning of 2017, despite plans to close the BBC Three TV channel in favour of an online service. The BBC today clarified that it will continue to show repeats until 2017. BBC Three has screened all series of Family Guy so far. Speculation over ITV acquiring the rights to the animated series started to circulate after the lift doors at ITV's HQ were redecorated promoting Family Guy, forcing ITV to admit it had been in talks to bring the series to ITV. A move from BBC3 to ITV2 is going to cause picture and sound quality to plummet. I've been watching on BBC3 HD, but even BBC3 SD is far better in picture quality than low bit rate ITV2.